A new rule announced last week designed to reduce acute exposure to hazardous agricultural pesticides for California schoolchildren and staff was welcomed by parents, teachers and environmental justice advocates, who nevertheless caution that much more is needed to ensure adequate protection for children's health. Although a significant step forward, advocates note that the rule fails to address near-constant low-level daily exposures, which a host of recent studies have shown cause severe long-term health impacts, including autism, IQ loss and cancer. And the new measure won't address the ongoing racial disparity in impact, with Latino schoolchildren in California twice as likely to attend the most impacted schools as their white peers. DPR's long-awaited rule establishes a first-ever statewide pesticide buffer zone around public schools and daycare centers in California. Among other safeguards, the regulation would prohibit the most drift-prone application methods, including fumigation, aerial, ground air-blast, sprinkler and dust application of pesticides, on fields within a quarter mile of school between the hours of 6am and 6pm, Monday to Friday. Growers will now be required to provide schools with an annual list of pesticides planned for use within a quarter mile. And there are additional restrictions on fumigant pesticides, which can't be used within a 36-hour period before a school day. But the new part-time buffer won't provide any protection for kids engaged in after-school and weekend activities, and doesn't account for the fact that many pesticides linger long after they are applied. A 2014 California Department of Public Health (DPH) report on pesticide use near schools noted that eight of the ten hazardous pesticides most commonly used near schools persist in the air for days or even weeks. "Pesticides have no respect for the school calendar," said Francisco Rodriguez, president of the Pajaro Valley Federation of Teachers in Monterey and Santa Cruz counties. "A part-time no-spray buffer zone simply does not protect kids from exposure." The DPH report also documented a marked racial disparity at the most impacted schools. In the 15 agricultural counties studied, Latino schoolchildren were nearly twice (91%) as likely to attend a school near the heaviest pesticide use as their white peers. "I'm thoroughly disappointed that this policy does nothing to lift the unfair pesticide burden from Latino children in California," said Byanka Santoyo, a member of the Kern County Coalition Advocating for Pesticide Safety. "It's a policy that treats Latino kids as less worthy of protections." The regulation's failure to address chronic impacts of repeated low-level pesticide exposure was telegraphed at a March hearing convened by the Senate Environmental Quality Committee by senior DPR staffer Randy Segawa, who testified that the regulation is "not designed to reduce exposure." This came as shocking news to environmental health advocates who have long fought for a regulation that would do exactly that. "We know repeated exposures to even small amounts of pesticides contribute to significant and permanent health problems, including cancer, neurological disease, respiratory impacts, and birth defects," said Nayamin Martinez, Executive Director of the Central California Environmental Justice Network. "How can DPR ignore these chronic effects of pesticide exposure on school kids?" Although the part-time quarter mile buffer zone provided by the regulation is an improvement over the existing patchwork of county restrictions, community leaders and scientists point to recent incidents as evidence that a bigger buffer zone is needed. 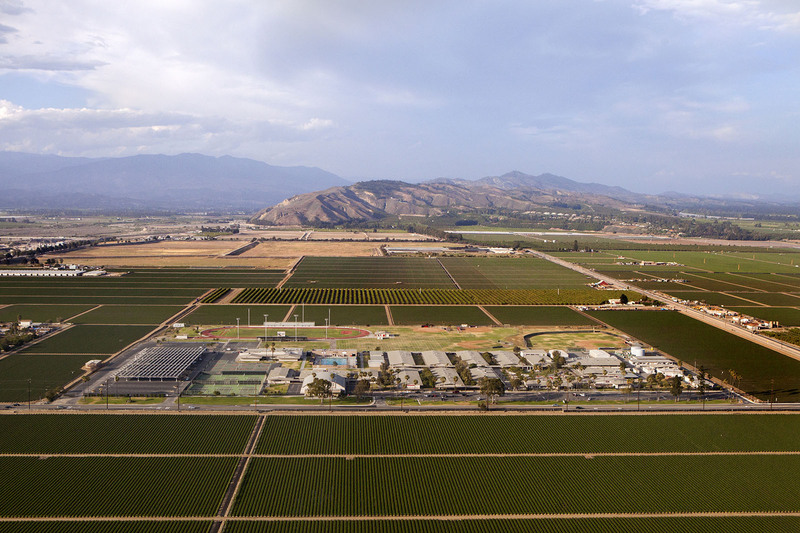 In May, dozens of workers in Kern County were affected by the brain-harming pesticide chlorpyrifos, which drifted more than half a mile from the application site. Chlorpyrifos made headlines this year when Trump's appointee to the U.S. EPA, Scott Pruitt, defied his own scientists and denied a planned federal ban, despite mounting evidence of severe neurotoxicity even in very low doses. The incident in Kern reflects mounting scientific evidence regarding drift distance. In one study by state and federal health departments, a one-mile buffer would have prevented 85% of acute exposure illnesses, while only 24% of non-work drift illnesses occurred at distances of a quarter mile or less. A UC Davis MIND Institute study documented significantly increased rates of autism in children of mothers who lived up to one mile from fields. The UC Berkeley CHAMACOS study of farmworker families in Salinas found contamination from the neurotoxic insecticide chlorpyrifos in homes up to 1.8 miles from treated fields. And the California Childhood Leukemia Study reported elevated concentrations of several pesticides in the dust of homes up to ¾ mile from treated fields. When the regulation was first announced last fall in draft form, it included a requirement that growers give schools 48-hour notice of any pesticide use planned within a quarter mile. Under intense pressure from lobbyists from the agriculture and pesticide industries, this requirement was axed from the final draft, leaving only the requirement to provide general notice to schools of any pesticides that may be used in the coming year. The right to know about, and hence to avoid, chemicals in use nearby has long been a key demand of impacted agricultural communities, who complain about the lack of transparency and the difficulty of accessing information that would allow them to protect themselves and their children. "For too long, information that residents need to protect themselves and their families has been all but impossible to obtain. For community members, notification is an integral component that cannot be left out of the regulation," said Tulare County community organizer Angel Garcia. Public health advocates point out that notification requirements are already in place and working well in Santa Cruz and Ventura Counties. "We have events in the evening," Oxnard Union High School District Superintendent Penelope DeLeon told the Ventura Star in March. "Our facilities are being used all the time. The notice gives school principals the opportunity to ask a grower to delay the application if there is a conflicting school event. I would hate not to be getting the notifications." DPR's announcement comes more than three years after the 2014 release of a report by the California Department of Public Health (DPH), which for the first time documented the extent of use of the most hazardous agricultural pesticides near public schools in 15 agricultural counties in California. The report revealed that more than half a million pounds of 144 pesticides of public health concern are used within a quarter mile of California schools each year. The ten most heavily used are all associated with at least one severe impact on children's health and learning. These schools are attended by 500,000 students, who suffer long-term chronic exposure throughout their childhood to chemicals known to cause cancer and other severe health impacts. Health and justice advocates point out that the new regulation is just a start, and that agricultural methods that cause harm to children and the environment are not sustainable in the long-term. Community leaders from California's agricultural regions are calling on DPR to lead the way toward a transition from hazardous agricultural pesticides. "Policymakers need to provide support and training for farmers to transition to safer farming methods that don't harm kids. We urge state officials, particularly DPR, the Department of Food and Agriculture and the Governor to make the necessary investments in the future of California agriculture," said Margaret Reeves, PhD, senior scientist with Pesticide Action Network. California's Office of Environmental Health Hazard Assessment (OEHHA) will take up consideration of Prop. 65 listing for the neurotoxic organophosphate chlorpyrifos this month. The November 29 hearing of OEHHA's Developmental and Reproductive Toxicant Identification Committee (DARTIC) will review the substantial body of scientific evidence pointing to chlorpyrifos's developmental toxicity and will make its Prop.65 determination. Californians for Pesticide Reform submitted comments for the committee's consideration, and coalition members will be in attendance at the hearing. JOIN US! The hearing is open to the public, and will take place Wednesday, November 29, 2017 beginning at 10 a.m. at the California Environmental Protection Agency, located at 1001 I Street in Sacramento.